Unless you’re Mr. Clean himself, cleaning probably isn’t your favourite hobby. We could be wrong, and you may start your day with a strong desire to wash your windows, but for many it is tough to get started. If you are in need of motivation, here are some tips to get you on your way to clean! Start first thing in the morning! 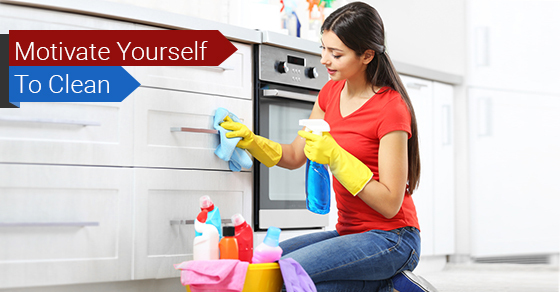 Like working out, cleaning can be one task of the day that you dread or feel overwhelmed by. If this is the case, do it first thing in the morning and get it out of the way. Not only will you alleviate the anxiety that builds up later in the day, but you will also feel accomplished once it is completed and you can go about the rest of your day with the same stamina and can-do-it attitude. Make a to do list and stick to it! If you plan out your day and set a schedule (write it down!) you are more likely to do it. Make a list, put it in your calendar, tape it to your fridge–wherever you will see it that will remind you to complete your to do list! Then give yourself a pat on the back for every item you check off. Establish a routine! If you have the ability to do so, plan your cleaning in small doses on specific days of the week and knock them off one by one. Perhaps Monday is laundry, Tuesday dusting, Wednesday washrooms, Thursday kitchen and hard surfaces, Friday floors, and weekends yardwork. Make it work for your family, but a little bit goes a long way! Avoid distractions! Put down the phone, iPad, laptop and Netflix, and tune out the world! Every call, text or game app takes time and makes your cleaning seem to drag on! Instead, throw on a playlist of motivating music and get to work! Get help! Why not involve the whole family (since they live there anyways!) and have them help you clean. It goes a lot faster when you have the team helping work towards a common goal. Remember to assign age-appropriate tasks that will allow your kids to learn responsibility and a sense of accomplishment when your work is done. Reward yourself! Perhaps with a special meal, luxury relaxation time, or a cup of tea or coffee. This is a great way to celebrate a job well done and will motivate your family to help again if the end is a pizza and movie night!